Drive-by Genealogy, 2016 – Lois Abromitis Mackin, Ph.D. In June my husband and I drove from our home outside Minneapolis, Minnesota, to my family’s summer cabin in northeastern Pennsylvania in order to spend a few weeks with my mother before attending the Advanced DNA course at the second session of GRIP–the Genealogical Research Institute of Pittsburgh. On our route we passed a number of places of significance in our family history. On Day 1 of the trip we drove southeast through Wisconsin on Interstate 94. Passing Madison we acknowledged my husband’s Mackin and Lohff ancestors who settled west of Madison in Dane County in the 1850s. The Mackins lived in the Town of Vermont, between Black Earth and Mount Horeb, and the Lohffs lived in the Town of Springdale. Lizzie Lohff married John Mackin in 1885 and shortly thereafter followed Lizzie’s older sister Emma Boeck and her husband to Mitchell County, Iowa, where they farmed and raised their family. Farther south, just before crossing into Rock County, we passed Stoughton, where another pair of my husband’s great-grandparents, John Isaac Galt and Jessie Sturtevant, married in 1886. The Galt newlyweds, both from the town of Cooksville in Rock County, also went to Mitchell County, Iowa, settling in the northern part of the county near Otranto. Proceeding into Rock County, we passed Cooksville itself, an interesting little New England town transplanted to Wisconsin, then bypassed by the railroad and preserved. Cooksville was home to the Galt family and their in-laws the Leedles, Armstrongs, Sturtevants, and Van Vlecks. Cooksville’s historic district is listed in the National Register of Historic Places. Off to the east, in Geneva, Walworth County, we passed one of the homes of my husband’s Kinney family from County Tipperary, Ireland. Peter, the patriarch of the family, arrived in Walworth County in the late 1840s from Oswego, New York and buried his wife Bridget McDonagh there before heading for Buchanan County, Iowa, in the 1860s with his son Thomas Kinney and Thomas’ family. Several more of Peter’s married children made the trek to Iowa, leaving several other children and their families behind in Wisconsin. Moving farther south, we passed Beloit, home to my husband’s great-great-grandparents, Michael Gerbig and Catharine Weigle, immigrants from Germany. Michael worked as a stonemason in Beloit, and the couple raised seven children there during the 1850s and 1860s. Catharine died in Beloit in 1867 and is buried in Oakwood Cemetery, along with her parents. After her death John Michael remarried and moved to Mitchell County, Iowa, where he farmed in Union Township, raised a second family, and became one of the founders of the Union Presbyterian Church. My husband and I like to avoid driving through Chicago, even though it makes our trip longer, so we continued south into Illinois. There, on the second day of our trip, we passed Sublette, Lee County, where more of my husband’s great-great-grandparents, Martin Decker and Susan Small, married in 1857. Susan’s father Adam Small died in Illinois, but the remainder of the Smalls and Martin Decker’s extended family moved on to Mitchell County, Iowa, and neighboring Mower County, Minnesota. In Mitchell County Martin and Susan’s daughter Mary Decker married Charles A. Gerbig, son of John Michael Gerbig and Catherine Weigle. Farther south in Illinois, on the same day, we passed Toluca, where Sophia Ellen Trewren, a sister of my great-great-grandfather George Trewren from Ludgvan, Cornwall, settled with her husband John William Curley and their family between 1900 and 1910. John William was a coal miner who emigrated from England. Both he and Sophia died in Illinois. Turning east at Bloomington, we drove by way of Indianapolis into Ohio, where on the third day of our trip we passed Millersburg and Wooster. That area of Ohio, Holmes, Wayne, and Knox Counties, was home to my husband’s Clark, Neville, Buckmaster, and Barnes families in the first half of the nineteenth century. By the 1850s, successive segments of those families were moving westward to Buchanan County, Iowa, where they intermarried with the Kinneys. We had already passed a westward outpost of my family in Van Wert County, Ohio, where several collateral members of the Lutz family took up land and settled before 1850. Moving into Pennsylvania, we came into my family’s home territory. In Clinton County we passed the homestead and burial place of my great-great-grandmother Rebecca (Andrews) Whetstone’s younger brother James Albert Andrews. 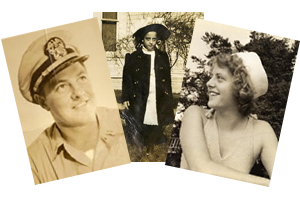 I have DNA matches with several of James’ descendants and am hopeful that their DNA will help us learn the identity of Rebecca and James’ mother Phoebe Houser’s parents. Just a little further east we passed Montgomery, Lycoming County, where Rebecca and James’ father Peter passed his final years in the early 1880s. Peter’s children William, Soloma, Daniel, Hannah, Lewis, and Kathryn also lived in the Montgomery area. Peter’s sisters Lydia (Andrews) Houser and Catharine (Andrews) Rumbel Bankes lived nearby in the White Deer Valley. Turning north at Hazleton toward Wilkes Barre, we bypassed the Schuylkill County area where my parents’ families were centered. Due to a misbehaving engine coil, though, we got up close and personal with the area of Wilkes Barre where my great-grandfather Roland Neifert lived with his second family in the early 1900s. After getting the car fixed, we arrived at the summer cabin on Lake Wallenpaupack that my grandfather Emerson Clinton Neifert built in the 1930s, with the help of Herbert Edmonds, a cousin of my grandmother Mary Irene Weaver. We’re hoping to spend an enjoyable couple of weeks here with my mother vacationing and connecting with cousins.